As a reviewer every now and then you will come across a bad game, and you know what, I don’t mind that as it’s part of the job. Sometimes though you’ll get stuck when evaluating these titles, as you have to think long and hard about what makes a bad game, what makes a good game and everything else in-between. The hardest part is always coming to a conclusion about it, as there are so many different things to consider. Combat Arms is one of those games. Combat Arms (CA) is a very interesting game because of what it tries to do. 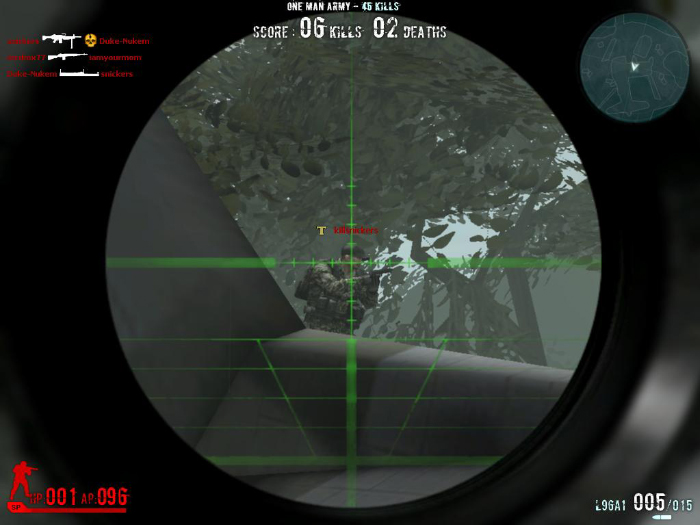 It tries to create a good online first person shooter that’s free and is available to everyone. In some respects it achieves this as the core gameplay is strong, and has good pacing. Sure Combat Arms takes bits and pieces from other online FPS’s, but this isn’t a bad thing, as it manages them in the right manner, creating an generic yet fun game. The main problem with Combat Arms is that it isn’t polished, in fact nowhere near polished. There are lots of game bugs in this title; you’ll always see guns and corpses floating in midair and the animation of the other players is always choppy, which is due to bad animating and net-code, meaning that you won’t ever really see anyone actually move properly, but rather “lag” to where they’re supposed to be. The killcam can also become very dodgy from time to time, with bits of leg or body sometimes filling the whole screen. Graphically the game does average for a “Free 2 Play” game, as the environments are generally solid and the character and their animations, whilst being very basic, suit CA’s style and approach. The only problem is that you never really feel that the game is original or unique. Whilst the environments do work, you’ll feel like you’ve seen it many times before and normally done much better. There just isn’t any excitement in the game’s world, and whilst it does the job, they’re flat and boring. The fact is, you’ve seen it all before, and its imitations aren’t flattering. If you’re looking for story, then you won’t find any here. In the “Fireteam mode” you’re given various tasks, such as saving hostages; however there’s never really any main storyline. Then again, one can hardly fault it for that, as the majority of online First Person Shooters don’t. There is promise for a deep and fulfilling story with the Fireteam mode and it would be exciting if they created more maps and had a flowing story from each one. That’s the one thing in which Combat Arms has potential, and a lot of it, but potential doesn’t make a game good. As with everything else in Combat Arms, the gameplay is a jack of all trades which feels a lot like other online FPS’s on the market…but worse. You have a health bar and with each bullet you sustain you lose health. There’s nothing wrong with this system, it’s just it feels incredibly outdated and old. You can’t properly heal yourself, so then if you get hit a few times after respawning and find yourself on just a few droplets of health, you’re left with a disadvantage whilst trying to take out the other enemies. Of course one can’t really criticise the game for this, but it’s one of things that adds to the constant feeling of an aged product and a not very well designed title. The rest of the game is basic; see enemy, shoot enemy. There are a variety of fun and generally very interesting modes. My only proper gripe with the game is that once you have joined a server you have to stay there until the end of the match if you want to gain some XP and GP (the in-game currency) to spend on other weapons. This wouldn’t be much of a problem if nearly every match you joined didn’t last roughly 10-15 minutes, which can sometimes be very tedious to endure. After you’ve played a few rounds, you’ve basically played all there is. There aren’t really any proper incentives to come back, as the XP and GP drips out at alarmingly slow rates. You’ll have to play a lot of matches before you can get a gun you really want and by that time you’ll be so bored that poking your eyes with a toothpick would be more interesting and a better use of your time. Maybe I’ve got it all wrong though? If you’re a gamer who perhaps hasn’t played an online FPS (if that was indeed the case I would have to ask where you’ve been the past five years) then I think you’ll quite enjoy it. There are a lot of game bugs, but the simple fact is that you’ll get a solid experience out of it. If you have on the other hand played a game in the genre aforementioned, then I really wouldn’t recommend going near it with ten foot pole. Whether you’ve played a game in this genre or not, the community really kills Combat Arms. This game houses one of the worst communities ever seen in an online game. People will constantly accuse you of cheating when you’re winning, and in some cases you may even find yourself in the position of trying to insist to people on the forums that you aren’t, for fear of being banned from the game completely. Then again, if you are a particularly good player, you may make it your goal to make some 10 year old douche-bag scream cheater as it is most satisfying, especially when you kill them straight after they accuse you of such a crime. Whilst I’m sure there are a few clans in Combat Arms, and the game does do well by attempting to create a friendly environment for clans, this is one game where all the annoying and generally bad players congregate. There are a few good and fun people to chill with, but all in all, you’re not going to have a fun time hanging out in-game or in the forums. I’m still stuck regarding what to finally say about this game as it’s a double sided coin. On one side, the game is a horrible generic shooter that features poor game design and management of an in-game store, on the other side if you’ve never played a title in this genre, you might enjoy it. I think what I should say is this: don’t go near this game, unless you really do have an urge to play it, and if that’s the case be prepared for what is no more than a shabby mediocre, if that, game.